Let's say you want to entertain children at a birthday party. Or maybe you want to create some cool special effects on a stage or in a nightclub—as an alternative to smoke, fog or haze. Or at a wedding, you'll want the effect of blowing bubbles at the newly-wed couple as they're coming down the aisle. (It's an alternative to rice or confetti.) In any event, a bubble machine might be an interesting investment, if you host a lot of events like these. 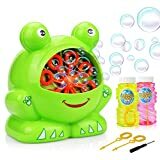 We can categorize bubble machines by their intended audience: There are professional models, that you’ll employ at a discotheque or wedding with many guests, that can supply a stream of bubbles for over 3 hours. Then there are miniature models for children’s parties, which can entertain the kids for around 30 minutes before you have to refill the reservoir (or they lose interest). Compare prices and find the best deals. Professional Bubble Machines: These will be capable of producing a huge number of bubbles over a long period of time. You would find such devices at nightclubs or wedding halls. One lightweight version is the 1byone Professional Bubble Machine: it has a high-output, automatic blowing mechanism that is suitable for outdoor or indoor use and has a sturdy handle that allows you to carry it from one event to another with ease. Its motor works at 18-22 revolutions per minute, producing thousands of bubbles. 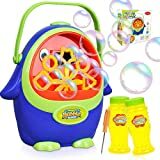 There is also the American DJ's Bubble Blast Bubble Machine that can hold 1.8 liters of solution, and consume 1 liter every two hours. It produces hundreds of bubbles a minute and has features such as a secondary fan to propel the bubbles even higher in the air. It also features a remote control and a timer. 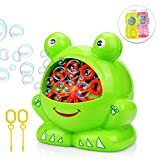 Children’s Bubble Machines: These will use a small quantity of bubble solution at any one time. They will also be very lightweight so that children can carry them around. 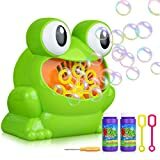 For example, Little Kids makes bubble machines for children that have themes from their favorite animated shows: PAW Patrol, Dora the Explorer, Spongebob, and more. 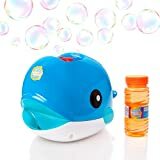 The bubble machines for children will usually weigh no more than 2-3 pounds, which will allow them to carry them around to a friend’s house if necessary. Battery- or AC-powered: Some people were pleased that their bubble machine came with an AC adapter—they didn't want it consuming a lot of batteries. On the other hand, a battery-powered machine means you can take it almost anywhere. Some even use it in a park or on a lawn for an outdoors event. Some of the AC-powered devices, such as the Co-Z Portable Automatic Bubble Machine Maker includes a fuse to prevent any damage to the device from a power surge. Serviceable parts: It's good that the bubble machine has replaceable parts. There is always the chance that the motor of one of the bubble wands will break. Some work on no more than a computer fan. Noise factor: Some users complained about the noise that the motor makes on their device. But that is also a matter of opinion. For example, some users of the Lightahead Portable Hubble Bubble Blowing Machine said that the noise created was no more than that of a household fan, while others said that the fan was too loud for them. Empty out the unused solution: It's best to pour out the leftover bubble solution when the machine isn't in use. Just put the solution into a container for later. Some customers complain that the machine doesn't run well if the bubble solution dries up inside the machine. Economical: Some notice that the bubble solution tends to leak out of some models of bubble machines. Others notice that their bubble maker would stop producing bubbles when the reservoir was only half-full--so make sure that the machine makes economical use of the solution. Use good bubble solution: People see drastically different results in the quality of their bubble machine, depending on the type of bubble solution that they use. 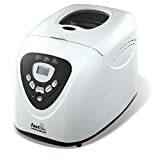 Even though many machines will accept any soap solution, you will notice that special brands such as Fubbles or Bubble Bonkers will produce bigger bubbles at a faster rate as well. Metal construction: Bubble machines made from metal will typically be more sturdy. For example, the Co-Z Portable Automatic Bubble Machine Maker is made of a durable metal casing and has an easy-to-fill reservoir. Maximum use of motor: Some customers said that the motor died quickly on the cheaper models. You clearly don’t want to overuse the device. 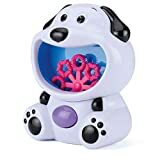 The makers of the Co-Z Portable Automatic Bubble Machine Maker warn against using the device for more than 8 hours at a time, so as not to strain the motor. Number of wands: The more wands, the more bubbles the machine will produce during every revolution. Dual-fan system: Some bubble machines will have an additional feature of secondary fan that propels the bubbles higher in the air. Number of bubbles per minute: You obviously want a machine that will produce a lot of bubbles. One machine that runs at 18-22 revolutions per minute can produce hundreds of bubbles. Even a small unit, like the Gazillion Bubble Hurricane Machine, can produce 500 bubbles/minute. 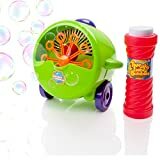 The distance that the bubbles go: You can find a bubble machine, such as the Creative Motion Bubble Machine, that can propel the bubbles from 1 to 3 feet. But then there are more powerful machines, such as the Prosource Turbo Deluxe High-Output Automatic Bubble Machine Maker, which can propel bubbles 6.6 feet. Fluid Consumption Rate: You will want to pay attention to how fast the machine uses up the bubble solution. Some hard-working machines for DJs will consume 1 liter of bubble solution in 50 minutes of use, others will use 1 liter in 2 hours. But you probably won't use it for hours on end—just a few minutes at a time will produce lots of bubbles. Don’t use outside when it rains: AC-powered bubble devices should not be left outdoors if there is a concern that it will rain. Water seeping into the motor can cause it to short out and cause a serious accident. Keep the machine level: Also, make sure that the machine is perfectly level. If it is at a slant, the bubble solution may seep into the motor and short it out. Slippery: You should also be aware that soap bubbles also pose a slipping hazard: If you're going to be using this on a dance floor at a disco, there might be a concern about people slipping on the bubble solution. But if you just use the machine for a few minutes at a time, and combine it with other atmospheric effects, people slipping on the bubbles shouldn't be a problem. Clean-up: Besides cleaning the machine, you also have to worry about the surface where the bubbles land. For use on grass or a tile floor, there shouldn't be any problems. But you might not want to use the machine on a carpet—sometimes the bubble solution can stain, and it's not easy to get it out of a carpet. Novelty soap solutions: The Bubbletastic Bacon Blower and the Little Kids Candylicious go one step further in bubble machines. The Bubbletastic uses a solution that creates a bacon aroma in the air, to arouse everyone's appetite (they have chicken flavor as well!) --that's a big hit at a picnic or barbecue. But the Candylicious Bubble Machine produces bubbles that are actually edible! They come in flavors such as grape, cherry, or tutti-frutti. 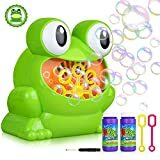 4-in-1 Devices: There are bubble machines that can produce other effects as well. The Froggys Fog 400W Venus Fog Bubble Machine has settings to produce bubbles, fog, smoke, and LEDs for more effects. Creative Motion-- are makers of a bubble machine for entertainment purposes for children's small parties. 1Byone—is based in Ontario, Canada, and is a manufacturer of electronics and computer peripherals, as well as power supplies, smartphone, and TV accessories. They also make products for stage lighting and effects. American DJ Supply—is based in Los Angeles, California, and are suppliers of lighting and audio products for the home as well as stage and mobile entertainment applications. They were founded in 1985, and consist of five companies: American DJ, Elation Professional, Acclaim Lighting, American Audio, AD-Systems and Duratruss. Their equipment is used by major entertainers, and famous clubs worldwide. Chauvet—is a DJ supplies company, based in Sunrise, Florida. They make a wide range of products for atmospheric effects (fog, smoke, bubbles, haze) and lighting effects for nightclubs and discotheques. Froggy's Fog—is a manufacturer of fog, haze and bubble fluid, as well as bubble and fog machines. Their products are used in theaters and theme parks, family entertainment centers, and nightclubs. They are based in Columbia, Tennessee.